Do you shudder every time you hear your little one sniffle or let out an Acchoo? Well, God bless you! The winters seem unwilling to budge and temporary fluctuations in weather are making it worse. 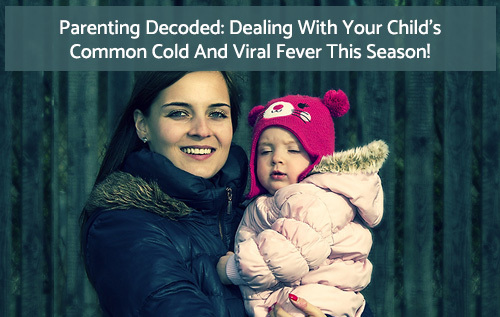 As primary caregivers for our child, we have no option but to chin up and brave the cold- the common cold. Here are a few tips you can keep handy while dealing with common cold, coughing bouts, runny noses and viral fever. As parents, it is our responsibility to make sure they feel better and resume their activity as soon as possible. But how? Hear it from a healthcare administrator. Dr. Shivani Shourie’s simple winter care tips to keep your worries at bay. Do the medicines prescribed by your pediatrician make you wonder if they are actually helping your child’s immune system? Read Sirisha Achanta’s account of dealing with fever without antibiotics and medicines. And if you’ve decided to steer clear of the medicines, here are home remedies by Swati Jain. Passed on and trusted over generations, you can rely on these at least for temporary relief. Who likes a sick bawling baby kicking furiously to get away from your clutches? The task of administering medicine to your little one nothing less than nightmarish. Here is Granny Sunita narrating her experience. Remember these pointers from Dr. Chander Asrani before you buy medicines over the counter. Follow the good practice of getting medicines prescribed after a check-up. Using your own judgement to administer medicines to your child can prove to be dangerous and is a habit that should stop. Vidya Sury recounts the horror when her son suffered from severe wheezing. The ordeal of syrups, antibiotics and inhalers that the child has to go through is painful to watch for a parent.